Tensions in the Texas House boiled over in a parliamentary showdown between Republican House Speaker Tom Craddick and some GOP and Democratic insurgents. It was a moment that has been building for weeks, with House members defiantly challenging the leader they put in power. Dissatisfaction has been building and on Friday night frustration turned into anger. Craddick survived a five-hour rebellion on the House floor that included a bold attempt to boot him from office, the physical restraint of insurgent lawmakers trying to overtake the speaker's podium, and the House parliamentarian nearly pushed to tears before resigning. With his political career in jeopardy, Craddick charged through a House rebellion that lasted into early Saturday, refusing to give up his leadership post and putting on display the bare-knuckle tenacity that boosted him to power. CBS Station KEYE correspondent Keith Elkins reports that anti-Craddick forces (known as "the insurgents") have whispered that there would be a move for a member vote to have the Speaker removed. That move came this week — or would have if the Speaker had allowed them to be heard. Republican Rep. Fred Hill, who has filed his candidacy to replace Craddick, made a parliamentary request that would allow the 150-member chamber to vote to oust Craddick. Craddick refused to recognize Hill to make the motion. Hill next asked to allow the House to vote to appeal the speaker, which would have required a two-thirds vote of the body. "The speaker's discretion to recognize a member on a motion on any matter is unappealable," Craddick said. By the time the House adjourned shortly before 1:30 a.m., Craddick had beaten back his opponents — but not before a series of raucous scenes unfolded in the chamber. Earlier in the evening, the House melted down when Craddick announced a two-hour break to escape pointed questions about his leadership. The 150-member chamber broke out in a cacophony of boos as lawmakers swept to the front of the chamber and Craddick, often called the most powerful man in state government, hustled back to his office suite. Democrats trying to overtake the speaker's podium were physically restrained by House sergeants-at-arms as they tried to grab the microphone. "It is clearly an abuse of power and of office," Republican Rep. Todd Smith of Bedford said later. Denise Davis, the House parliamentarian, resigned over the incident, according to a statement from Craddick. His spokeswoman later confirmed that assistant parliamentarian Christopher Griesel had resigned as well. Craddick's two-year term does not expire until the next legislative session convenes in January 2009, but discontent in the chamber is fueling a plot to force him out before the current 140-day session ends Monday. The oilfield mud salesman from Midland is the longest-serving member of the House. With three days left in the legislative session, lawmakers have spent the week hurdling through remaining legislation and much was left to be completed before Monday, including the $153 billion state budget. Democrats and Republicans complain that Craddick has ruled the House with an iron fist. They say his win-at-all-costs style often forces legislators to vote against the best interests of their own districts. Craddick was re-elected to his third term as House speaker in January, fending off another challenge. But strife has continued to hover over the House during the session. In the last week, four Republicans, including Hill, have filed their candidacies to be speaker if Craddick is ousted. Former state Rep. Terry Keel, a Craddick ally who stepped down to run an unsuccessful campaign for the Court of Criminal Appeals, was serving as parliamentarian when the House returned from the two-hour recess. 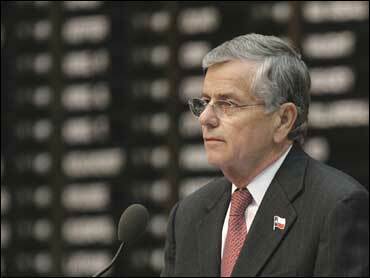 Former Rep. Ron Wilson, a Houston music executive who was known for his expert understanding of the rules, was serving as assistant parliamentarian. Insurgents quickly questioned Wilson's independence and some of his work as an attorney. Craddick parroted Keel's responses to every question. "Will you recognize any member of this chamber for a motion to elect an impartial parliamentarian?" Dunnam asked. When Craddick said that would be against the rules, Dunnam said, "We're gonna follow House rules? When?" to a burst of applause from a packed House gallery and lawmakers who oppose Craddick. As insurgents continued to press the parliamentary issues, Craddick attempted to move forward with bills, saying "some members would like to go on with the state's business." Craddick threw up a roadblock to his opponents when he told a Democrat that an effort to unseat him would be impossible under the House rules. To oust Craddick before his term is up, a lawmaker must make a parliamentary maneuver known as a motion to vacate, and a majority of the House must vote in favor of it. It's called a privileged motion, and a lawmaker must be recognized by the speaker before he or she may speak to the House to make such a motion. The issue Friday night was whether Craddick was obligated to allow lawmakers to speak if they wanted to. The meltdown Friday started when Democratic Rep. Jim Dunnam questioned Craddick about the parliamentary procedure. Craddick made it clear that he would not necessarily recognize someone to make that request and he was adamant that his ruling could not be appealed. A short time later, Smith asked Craddick if he ignored Davis' advice when he made the ruling. "I looked over and asked her and I don't know if she agreed or didn't agree," Craddick responded. "Did you or did you not ignore the advice of Denise Davis?" Smith asked. "It's a privileged conversation between the two of us," Craddick said. A short time later, Craddick called one of two recesses and retreated to his office. As business was put on hold, there were uncofirmed reports that efforts were underway to fly Craddick supporters back to Austin. When the Speaker recessed business until 11 p.m., the mood of nervous House members turned ugly. One screamed, "This is America. We don't do things like this here." Smith said Davis had told him earlier in the day Craddick had to recognize lawmakers' privileged motions. Smith said that when Craddick ruled the opposite way, Davis told him, "I'm resigning and Chris is going with me." Davis wouldn't comment as she bounded up the stairs behind the chamber to her office, nearly in tears. "I'm not going to talk about that," she repeatedly said. A woman with Davis slammed the door and turned the lock to keep out reporters. Later, Davis returned to the chamber, visibly flustered. One Democratic lawmaker approached her and demanded a written ruling on the parliamentary questions. "I'm not here to defend the chair," she told him, before agreeing to get him the response in the morning. In the statement announcing Davis' resignation, Craddick's office said he'd sought a wide range of legal opinions on the "intricate and complicated constitutional issues" he'd been presented in the past several days and in some cases has put a higher premium on that counsel." "As a result, Denise has resigned and has asked to be transferred," the statement added. "The Speaker will be complying with her wishes."